Back Home, but in California! We are now in California. We are visiting grad schools. We visited Berkeley (which we LOVE!!!!!!!) and Stanford (can you feel the smug!?) and we are having a good time driving around the bay area. Currently, we are sleeping out of our mini-van which we rented. It is crappy! It is a Chevy Uplander, which is NOT a mini-van easy to sleep in. It is crammed full of seats, two captain style and one rear bench seat. We have to take three out of the four seats out, stack them precariously on top of each other, and cram one in the front to get some room for both of us to lay down in it on the floor. At least the floor is flat when you take out the seats. We were expecting a Dodge Caravan or something, but got stuck with a Chevy. It wasn't too expensive, so thats okay. We really love the Berkeley area the best. Right now we're chillin in a coffee shop with some WiFi internet, and for dinner we want to try out this Mt. Everest restaurant, with Nepalese and Indian cuisine. Mmmmm sounds interesting! Sadly, we're becoming Starbucks yuppies, as its the only quick coffee place open early in the morning. We get up around 6am so that we can beat San Fransisco traffic (plus, we want to hide under the cover of darkness, since we sleep in motel parking lots). Good news. . . both of us are now officially accepted at the University of Utah!!!!!! YAY! Houses are really cheap there, but sooooo expensive here in California. We got good vibes when we visited the Fluid Mechanics Lab at Berkeley today. We both liked it and it might be possible for both of us to study in the same lab if we are accepted! Hahaha that would be funny! Since we´ve been done trekking, we have just been hanging around the city. We wanted to go to Ushuia, but all the busses are full! Also, we tried changing our plane tickets to leave to Santiago early to visit there, but LAN Chile airlines are retarded! We couldn´t change our tickets. So instead, yesterday, we went to Fuerte Bulnes, about the most southern spot you can drive on the continent! It was a reconstruction of the old fort which was there in the mid to late 1800s. The people from the fort eventually founded Punta Arenas. Today is a relaxing day with not much to do except upload photos, do laundry, etc. 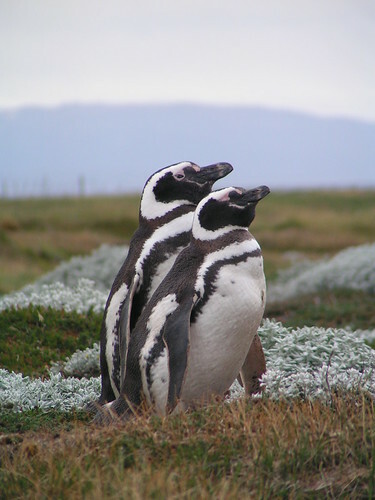 Tomorrow we will go on a ferry and cross the Strait of Magellan to Tierra Del Fuego to the city of Porvenir, Chile. There is supposed to be a Laguna with a nature reserve and flamingos! So we will go there overnight, and come back Sunday. Then we fly out on Monday. We are finally done trekking in the national park Torres Del Paine, which we nicknamed Torres Del Rain & Pain! Well, it was very very beautiful, although the weather beat us up! Wind, rain, sun, sleet, snow, all in one day and almost every day of our trek! We started at the main entrance, and walked around the entire park (full-circuit), but stopped short of the final leg. So I guess we cant really say we walked around the whole thing, but all of it except the final 6-hour leg. We trekked through mountain valleys full of white and yellow wild flowers the first day. We had a hot and sunny day and then camped at Seron. The next day, we woke up to a rain storm which covered all the mountains around us in a dusting of snow. It rained on and off the second day while trekking about 6 hours to the next camp, Lago Dickson. We were camped next to the mountains, but it continued to rain on us all night and snow up in the mountains. The next morning, the rain was still very stubborn and would not go away, so we had to trek again all wet to the next camp, Los Perros. It snowed and sleeted on us as we climbed higher and higher over the trek that day. This camp was at the base of the mountain pass which we had to hike over, Paso John Garner. We camped there and finally it dried out the next day. But Jenn got sick with some 24 hour bug, so we all spent the sunny day relaxing, getting ready for the hard hike over the pass the next day. It wouldnt have been a good day to go over the pass anyways, since it was cover in about a foot of snow, and then you cant see the trail! Hiking over the mountain pass was very difficult, since it was steep and rocky, above the tree-line and sometimes cover in snow. Once we got on top, the clouds blew away, and we were rewarded with a clear view of Glacier Grey, and huge glacier which come out of the icefield to the north. Now that we were up, we had to go right back down, but at least it was nice and sunny. When we got to the next camp, Campemento Paso, we were so exhuasted! The next morning we slept in late, and then got ready for another nice hike to Lage Grey, the glacier lake. Here we were treated to a hot shower! What a relief. We camped next to floating icebergs that night and howling wind over the lake. The next morning brought more rain so we had a late start hoping that if we waited long enough, the rain would stop. But it didnt, so we just started hiking to the next camp. It really cleared up half way through our hike, which was a relief. We saw a condor flying high over the valley besides us. We also finally got a peak at the tops of the mountains. They were all ragged and looked like Mordor from Lord of the Rings. 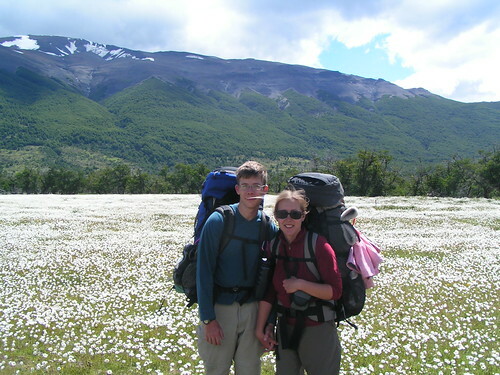 When we finally reached camp Grande Paine, we saw the `horns` the famous granite peaks of the park. They were so cool looking! They also had a store there, so we got to taste real food, like milk, juice, cookies, and potato chips! Mmmmmmmmmm. The next morning, we continued on to Camp Italiano just 2 hours away, hiking along lakes in the forest next to the large granite peaks. When we got there, rain was misting over the mountain, so the camp was always wet. We set up camp and then walked up the valley to get a better view of the mountains, but the ever returning rain stopped us! The rain never stops!!!! 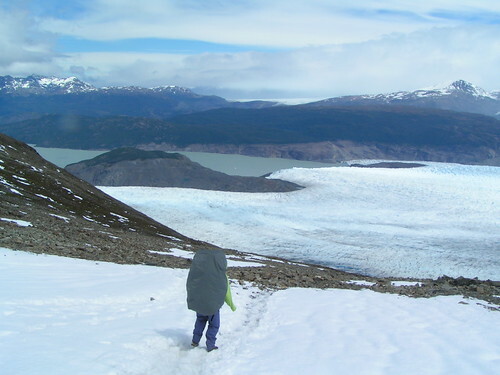 The next morning, after deafening howling wind all night, we decided to finish our trek by going pack to Grande Paine and catching a boat to the exit of the park instead of hiking an additional 6-8 hours to complete the full circle finished at Los Torres camp. Thats okay! We were tired of trekking after 9 rough and tough days! We were all battered by the elements, but it was so worth it! Now we are back in town, headed back to Punta Arenas by bus. We have a few more days before we have to go home, so we are going to Santiago. There, we will hang around the beach for a few days. After being so cold some nights here in Patagonia, we are looking forward to the heat in Santiago. It should be on the 80-90sF!! !